M2M Mending Plate is one of a variety of leg plates that we currently produce. We also provide our customers with spec. plates which can be designed to fit individual furniture or different individual needs. > Holes can be changed. 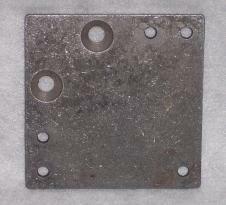 M2M Mending Plate is a heavy duty 1/4” leg / mending plate. Measuring 3-3/4” X 3-3/4”. These plates can be customized to customers specifications. Holes, sizes, locations and countersinks can all be changed to meet customers needs.